How it happened: Sunday’s exhibition against the University of Indianapolis, a perennial top 20 team in Division II, was a step up in competition from last weekend’s contest against Marian University. But the Hoosiers had little trouble with the Greyhounds, who shot a dismal 41.2 percent from the field. Credit an improved Indiana defense, which held UIndy to .85 points per possession in the win. Offensively, Indiana still has plenty to work on, but there were several bright spots. The Hoosiers committed just eight turnovers and grabbed 16 offensive rebounds for 16 second-chance points. 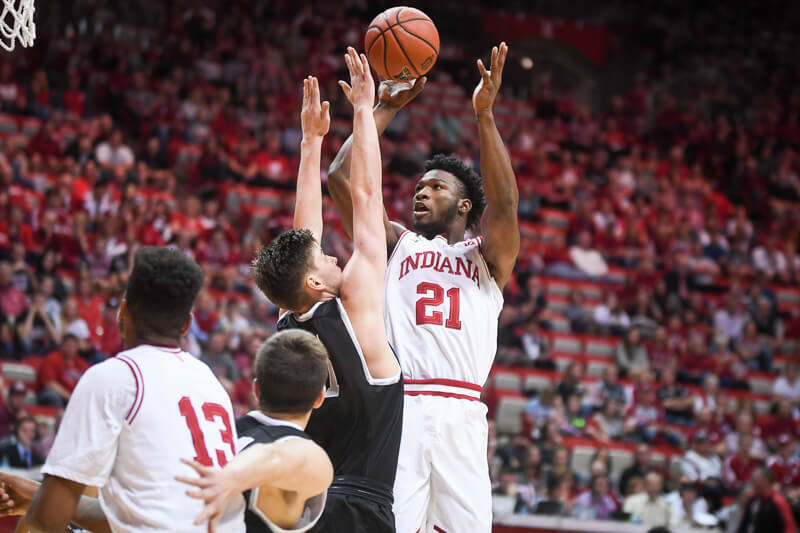 Indiana’s offense doesn’t look as explosive as it’s been in recent seasons through two exhibition games, but the Hoosiers are much more sound fundamentally on both ends. Standout performers: Senior forward Freddie McSwain is finding a role as a guy who can rebound, defend and also finish some plays around the basket through two exhibitions. McSwain finished with 12 points and nine rebounds in 13 minutes on Sunday. Collin Hartman also returned to action for the first time since IU’s 2016 NCAA tournament loss to North Carolina and scored nine points (3-of-3 on 3s) in 15 minutes off the bench. Robert Johnson also had 18 points on 7-of-15 shooting to go along with five rebounds. Statistic that stands out: After turning it over on just 13.6 percent of its possessions in the exhibition win over Marian, the Hoosiers did an even better job of taking care of the ball against the Greyhounds. Indiana finished with eight turnovers for a turnover percentage of 12.8. McSwain with six offensive boards in 13 minutes! Alex doesnt seem to be as excited as i am about the improved defense, fundamentals and turnovers. That’s what we need from him!!!!! Things are still pretty rough, especially on offense. But what I’m happiest to see is the improvement from half to half and from game to game. And I love that visible adjustments are made during timeouts and at the half. So relieved that Davis is ok. Thought CH might have to play center this year again! Yes, yes, yes. And the emphasis on defense and taking care of the ball. Missed a ton of bunnies. But even so, FM was usually in great position. Now if he can hit of few of those layups when he grabs the offensive board… Not knocking his play, of course. He was excellent today. The two things most people were looking for this season: better defense and fewer TOs. Pretty much to script so far. Another encouraging outing. Still a ways to go yet, but they definitely seem to know where they’re going and how to get there. Loved Freddie’s effort…did you see THAT Juwan….need the same or better from you bud! A few to many quick three’s IMO..but loved the defense and lowered TO’s. I think he asked the question” Where are our points coming from this year”..asked a damn good question. The D is improved, but most definitely not a finished product. Still too many easy baskets given up. No comments about “the anointed one?” LOL! Seems it might be a team of moving parts rather than one star as so many were declaring last week. Just listen to Archie’s presser he wasn’t to happy with the quick threes!! Boy am I glad he didn’t like it!!!! Nice to see QT get a trillion on his birthday. Of course they aren’t perfect. And most of us, setting the homers aside, only expect improvement in fundamentals and a team that’s fun to watch and competitive this first season. What do you base your comment on? At this point….it’s almost like you’re saying at this rate we are never going to see another banner. What are you really saying and why so I understand what you base your comment off of and why? The coach, team, who we played, what? I will agree it’s been a long time but can’t we agree that you are seeing changes that have already taken place to set us up for success. We know it will take time. He said he would recruit from with-in state first, he has. He is a def mind coach, and look at the difference from half to half and game to game. The TO are stupid down, the def is a work in progress and is already better than last year’s two exh games. We may not win the B1G this year but I really believe we finally have a coach that is all business, knows how to coach, and if he can get the recruits (like he is getting) then the sky is the limit. Sounds like you go way back like myself. RMK was also all business, my assumption. Can’t agree more, everything he has said he will do, he has either already done it, or work in progress. Regardless, I like what I’m seeing. I think he is strickly business and no fluff. I like the golden shirt (yellow) rule. Not sure if that was his idea or just re-instated. Give him a chance my friend. We just started. It is sad that these facts are true. IU waited too long to make major changes. Assuming you are not a troll (I would actually like you better if you were), then you’ve nearly perfected the crotchety old man routine. Just throw in an occasional “stay off my lawn” and I think you’ve got it. I haven’t watched the game yet, but how/why did Morgan take only 1 shot? I won’t jump to conclusions having not seen the game, but this doesn’t make me believe Morgan is “the guy” if he isn’t taking shots. Why do you even bother coming on here then? Anybody know why Race didn’t play?